I sat at the Ashland Hawk Watch with a local birder also named Joe this past Monday enjoying a beautiful day without many hawks. Joe had seen 276 species of birds in Delaware for the year, and came to Ashland to add one more…a Golden Eagle. Being a slow migration day, we simply enjoyed some conversation and the occasional Red-tailed and Red-shouldered Hawk that whizzed by. I told Joe that you never know when you are going to “strike gold”. Golden Eagle migration is at its peak in the first half of November, and they can come through just about any day in any weather. At 11:50 a.m., just after other birders, Hank and Carol appeared, I saw a bird out of the corner of my eye and yelled to everyone, “get on that bird”! Sure enough, it was an immature Golden Eagle! Joe and I high-fived to celebrate his 277th species of the year in the state. This was Golden Eagle number 20 for the fall migration season at Ashland Hawk Watch. 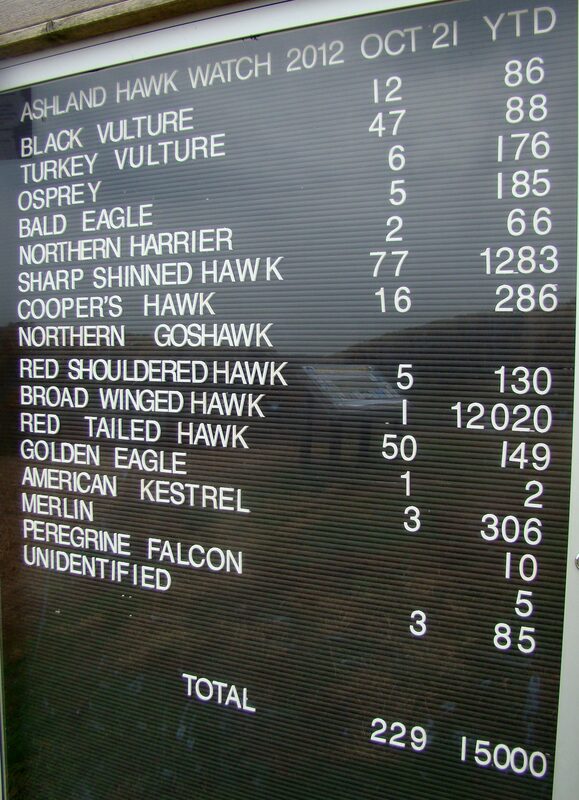 Between 2007 and 2012, the most we have seen during any hawk watch season was 13 in 2009. Sighting a Golden Eagle means much more than just a number, however. 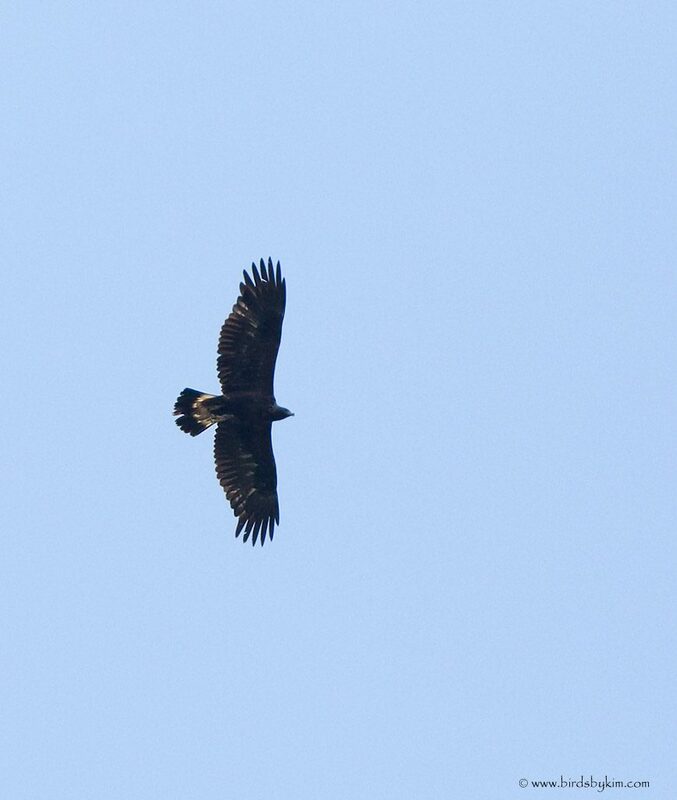 I got a photo of the Golden Eagle that passed Ashland Hawk Watch on Monday, November 11, 2013. Note the small head, long tail, and white on the base of the tail and inner secondary feathers. Golden Eagles in eastern North America are rare, and are more common in western North America and even wild areas of Asia and Europe. Most of the small eastern population nests in northern Ontario, Quebec, and Labrador in remote, rugged, wild places. Rare and wild are two adjectives that certainly apply to Golden Eagles. Add to that exciting, majestic, agile, and powerful. To me, they represent a symbol of wilderness, like hearing a wolf howl or seeing a whale breach. This most powerful and fierce North American raptor stakes claim to territories of the far north that I can only dream of. It rules over these wild and remote landscapes as a top-tier predator. Seeing a Golden Eagle is to imagine the beautiful northern ecosystems it has been, to get a taste of unspoiled wildness, and sense its supremacy over the furred and feathered. Golden Eagles are the size of a Bald Eagle but usually hunt more like a fierce, fast, large, agile, and powerful hawk. Our national symbol is more likely to be found eating carrion, plucking dead fish floating on a lake, or stealing food from other eagles and Osprey. Goldens are known to do these things too, but usually represent themselves as first-class hunters. They eat mostly rabbits and squirrels across their range, but they are also known to capture and kill large prey such as goats, deer, seals, coyotes, bobcats, and large birds like swans, cranes, and herons. Seven methods of attack have been described for Golden Eagles. My two favorites, however are “low flight with sustained grip attack” and “walk and grab attack”. The former is used to ride on the back of large prey, gripping it until the prey dies, and the latter to capture prey that are hiding behind an obstruction. These birds can dive at almost 200mph and even hunt in small packs like wolves. (The Birds of North America Online (A. Poole, Ed.). Ithaca: Cornell Laboratory of Ornithology; Retrieved from The Birds of North America Online database: http://bna.birds.cornell.edu/BNA/; Nov, 2013). This Golden Eagle photo is from Kim Steininger, a volunteer at the Ashland Hawk Watch. Golden Eagles may be one of the most revered, honored, and embodied birds in the world. In J.R.R. Tolkien’s Return of the King, one of my favorite scenes is when the Gwaihir, basically gigantic Golden Eagles, come to the rescue, killing dragons, and flying away with the good guys on their backs. Check it out! For some Native American tribes, Golden Eagle feathers are as symbolic as the crucifix for Christians. They are the national animal of five nations including Mexico. They have also been symbols used by the Roman Empire and other European civilizations, in the Arab world, in the Bible and even by the Nazis. Needless to say, this bird has awed and inspired cultures all over the northern hemisphere for centuries. So I think that species number 277 that Joe witnessed on Monday at Ashland was not just another tick on his list, but rather another link in the chain of humans that have stared, wide-eyed, at this great symbol of the untamed wild. I will leave you with this video that Alan Kneidel captured of a Golden Eagle flying over Ashland Hawk Watch on November 2, 2013. Come try to see one for yourself soon, as the Hawk Watch season ends on the last day of November. 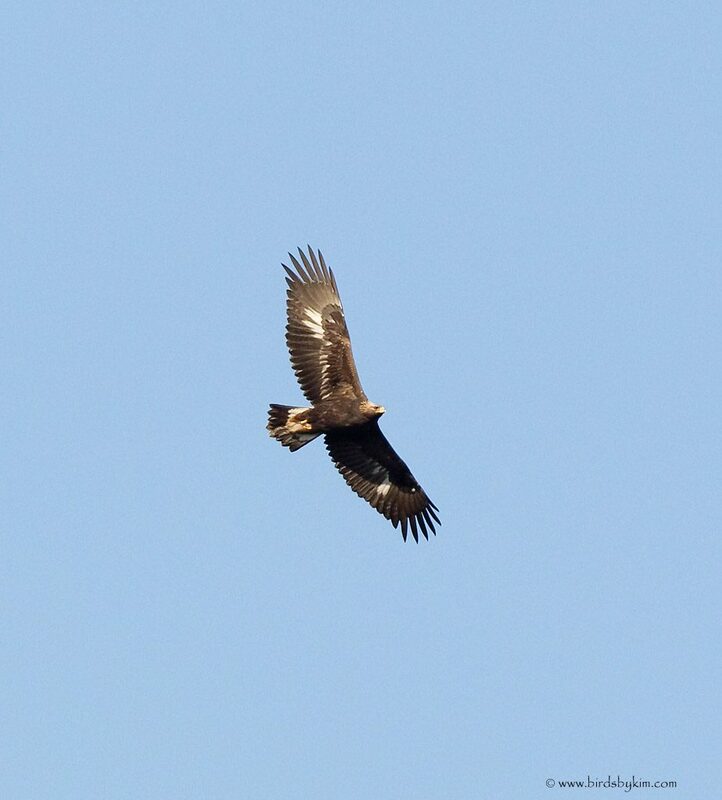 This amazing photo of an immature Golden Eagle was taken by Hawk Watch volunteer Kim Steininger in November as it flew past Ashland Hawk Watch. Ashland Hawk Watch, in its 5th autumn, began on September 1 this year. As of the end of November, it has proven to be one of the best years yet, with 13,548 raptors counted…so far. Cyrus Moqtaderi, in his third year as the Hawk Watch Coordinator, is staying on to count a bit more in December. We couldn’t be happier! Migration is continuing, and we expect to see more Red-tailed and Red-shouldered Hawks, and possibly more Golden and Bald Eagles, and perhaps a few surprises. The Hawk Watch will be operating sporadically over the next few weeks, usually on days fit for raptor migration. Cyrus will announce when the Watch will be open the day prior on the de-birds list-serve. If you don’t subscribe to this e-mail list-serve, you can look up posts here. Just sort the posts by date and pick the latest post from Cyrus. This was a great week at the Ashland Hawk Watch. The weather did not look that promising with winds out of the southeast, thick clouds brewing, and periods of rain, but that didn’t stop lots of raptors from flying south. Cyrus Moqtaderi, our official counter, and his dedicated staff of volunteers tallied 1,317 hawks pass Ashland this past Monday through Friday. Highlights include our first Golden Eagle and Northern Goshawk of the season plus over 200 Osprey, which is certainly the best 5-days for Osprey in the history of the Hawk Watch. Kim Steininger has been our most dedicated volunteer at the Ashland Hawk Watch this year. 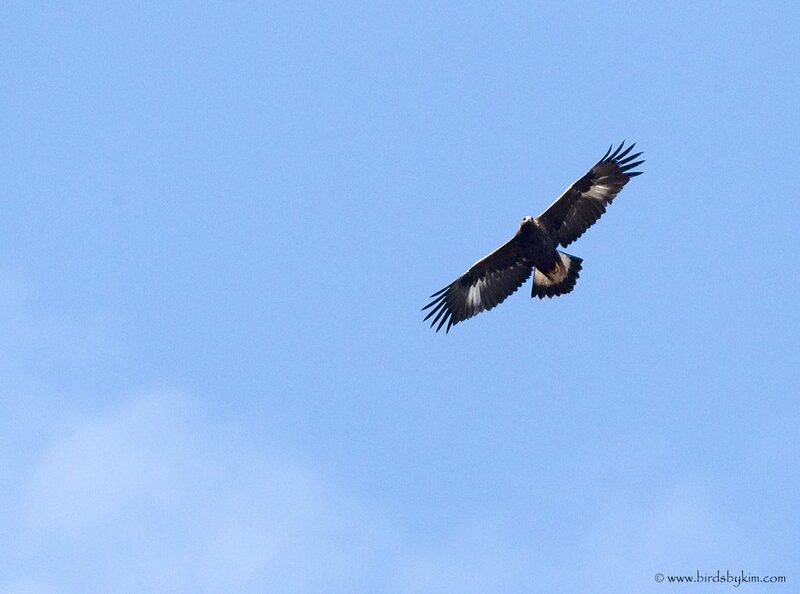 She captured this image of the Golden Eagle that flew by, 142 meters up. It was also a great week for Sharp-shinned Hawk with 341, and 208 American Kestrel is excellent. Broad-winged Hawks also made a reappearance on Friday with 247 cruising by. Finally, 15 Peregrine Falcons in 5 days at Ashland is pretty good for this usually coastal migrant. We usually only get around 25 in an entire season. 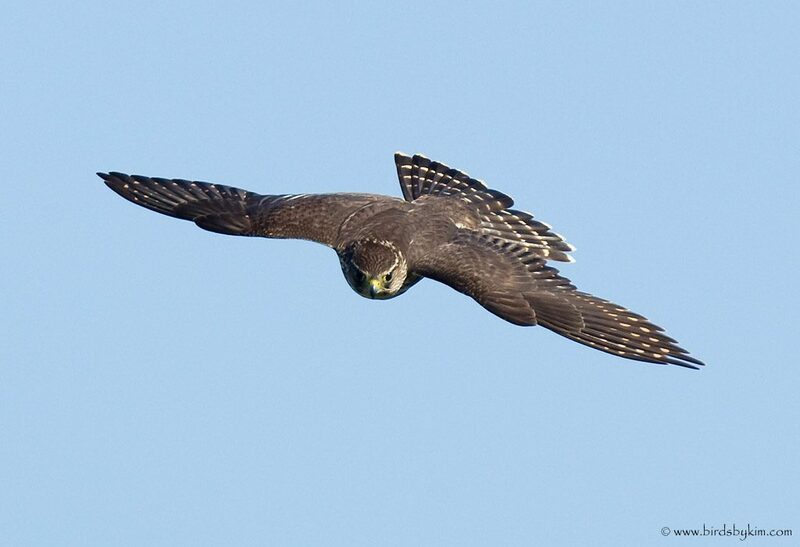 Kim Steininger also got great photos of this Merlin, which dive-bombed our fake owl near the Hawk Watch. 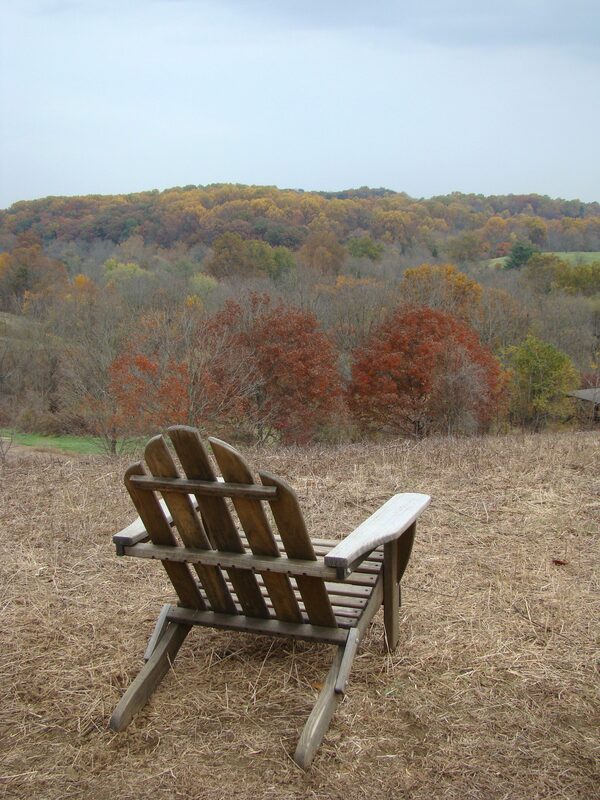 For one of the best wildlife viewing experiences around, visit the Ashland Hawk Watch, any day now through November. Early October is usually really alive with hawks, so come soon! For all the totals of the season so far, visit our HawkCount site. Also, October 9 is the Big Sit at the Ashland Hawk Watch, where the Twitching Talons team will try to identify as many species from the site as possible…all day long. Lots of good food and good people will be there, so don’t miss it!